The following typical test cases are introduced in this chapter. If these are used, a still more advanced test can be performed. This is the easiest test case. It tests in the following codes. This is the function which does sums. A result is returned to ans. However, this function is foolish. If 100 is exceeded,An error will be returned. /** Sums are done. A result is returned to ans. * However, he is stupid. * writes except zero to a return value. A header file is made in this code. A fool does not write a header file. A sage writes a header file. If you do not write a header file, it will have very bad influence on quality. Please put the following description into a header file. This is used for double include prevention. This is common sense. Please describe the following, when you use C++. The following is a test code. As for the function name to test, "test + function name" is recommended. As for the file name to test, "file name + Test" is recommended. It is recommended that the file to test and a test file separate a folder. Supposing you think that a test is inadequate, a test will be written more. If the above is seen, "The test of main() is not made." will understand in CUnit for Mr.Ando. If possible,separation of the test enviroment. Mixture is not cool! 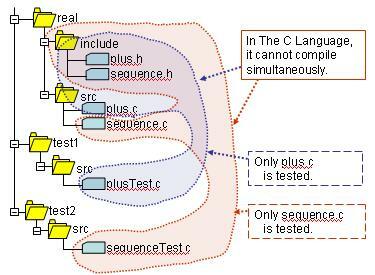 Figure : Separation of test folder. The following name space is used in CUnit for Mr.Ando. The test result is as follows. Next, in the following case, it tests using a Mock function. Only caller function can be tested by using Mock function. plus() is set to Mock function in sequence(). Variable inPlus_data1 and inPlus_data2 are prepared for input data. Variable outPlus_ans and returnPlus are prepared for output data. err = sequence(data1,data2,&ans); // run! plus.c cannot be compiled together. Please prepare another environment. This is restrictions not to make overwrite like Java in the C language. 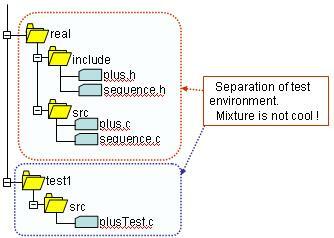 Figure : Separation of test environment. It is the test of if() or switch(). This is a file for a test. This is a file for a test. returnSetDataA = 5; // A mistake is mixed.